A range of simple financial products - likened to supermarkets' no-frills items - should be offered by banks, the government has said. The Treasury wants banks and insurance companies to come up with a range of basic savings accounts and policies that people can compare and understand. 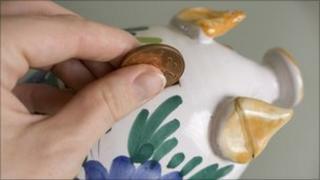 The government believes that this would encourage people to get into the savings habit. A similar scheme introduced by the previous government failed to take off. The government, in a newly-published consultation paper, said that the number of different financial products on the market with different terms and conditions could make the landscape confusing for consumers. For example, it said there were 2,000 different savings products being offered by 150 different providers. Difficulties in comparing these meant people were unlikely to switch, sticking instead to the status quo that might cost them more, or not be the appropriate choice for them. It wants to see a range of standardised, basic products that are easy to compare that would allow people to manage their finances safely. However, it said it would not interfere in the market. "It is not the government's intention that simple products should restrict consumer choice. It believes that they should sit alongside existing products similar, for example, to supermarket ranges which carry labels like 'essential' or 'basic'," the consultation paper said. Treasury Minister Mark Hoban said products could include savings accounts without confusing bonus rates that swiftly disappeared. He also encouraged the introduction of basic life assurance deals and reliable insurance that provided an income when policyholders were made redundant or were ill or injured. The latter is the theory behind payment protection insurance which has proved controversial owing to the way it has been sold in the past by lenders. In 1999, the Labour government attempted a similar campaign. This was known as the Cat - fair Charges, Access and Terms - scheme and aimed to encourage the take-up of savings products among low-income families and among those with limited experience of financial services. However this failed to make a significant impact, according to a review of the scheme for the coalition government by Professor James Devlin of Nottingham Business School. It also found a lack of awareness and demand among consumers, and price caps that made them less attractive for providers, and not very profitable. Such price caps would not be repeated in the latest scheme, the present government has said. The plan was welcomed by Peter Vicary-Smith, chief executive of the consumers' association Which?. "For too long the financial services industry has traded on complexity, rather than offering simple, transparent products that consumers need," he said. "The government must give the new Consumer Protection and Markets Agency the power to either set minimum standards or to ensure that it is easier for customers to compare products."